Taking notes is a key part of the research process because it helps you learn, and allows you to see your information in a useful visual way. Once you’ve gotten a group of high-class sources, the next thing to do is go through them in detail. When reading through your sources, it’s important to be taking notes. Not only does the note-taking process help you learn the information, the notes themselves are an important visual aid in your paper-writing process. There are as many ways to take notes as there are people. Everyone has a slightly different method. Some prefer to type notes on a computer, some choose to use notecards, and others like a good ‘ol pen and paper. The specific tool you use to take your notes isn’t as important as the notes themselves. Choose the method that’s the most comfortable for you. Information about the source so you can find it again – You’ll want to write down the author, title, date published, publisher, and URL (if it’s a website). A way to group notes – You’ll want to be able to organize your notes in a visual way so you can arrange them in an order that makes sense. Spaces for you to write down quotes (direct text straight from the source), comments (your thoughts and questions), and paraphrasing (information from the text in your own words). Skim your entire source before you read it in detail. Skimming will help you understand how the document is laid out and what the main ideas are. Search for the subject headings in the material you’re reading and write them in your notes. They’ll help you find relevant information faster, and they’ll provide you with reference points when you review your notes later. Write down every fact or note that may be of use to you in your paper. Don’t write down things you already know or would never include in your finished work. 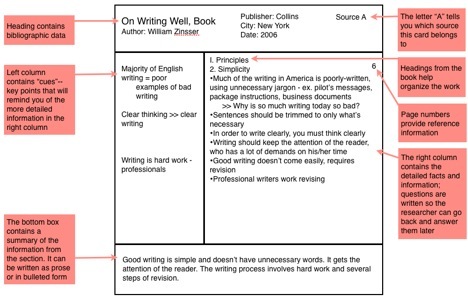 Break down the text into small groups of paragraphs. Read each group one-by-one, taking notes between groups. Breaking up the text into smaller, bite-sized pieces will help you process the information. Don’t write down information from the text word-for-word. This takes too much time and prevents you from using your higher brain functions to filter out and process important information. If a source is too dense or has too many dates, don’t feel like you need to write every bit of information down. Make a note of where the dense parts are and move on. In the following sections, we’ll cover some specific note-taking tools. Remember to choose the one that matches your style the best. Our web-based Notebook tool (part of EasyBib Pro, School Edition, and Library Edition) is a great way to organize research information. You can group and color-code your notes. You can create an outline easily by adding supporting information from your research. Using notecards is a great way to arrange research information visually. 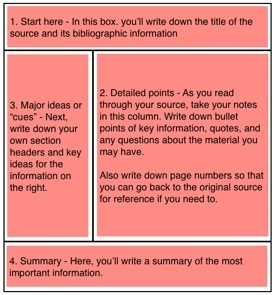 Have a “bibliography card” for each source. Have notecards for every major idea that the source discusses. Within the method of using notecards, there are many different formats to take notes. Again, the keys are to have a system that 1. works for you, and 2. includes all of the information you need. The Cornell note-taking method is a great way to manage notes for a lecture or any type of source. The Cornell system helps you commit information to memory. The Cornell note-taking method can be applied to taking notes for research. The method helps you retain information. There are a variety of electronic note-taking tools out there. If you like taking notes electronically, check out some of these tools. Evernote Multi-platform (computer, mobile, and web) note taker for to-do lists, image archiving, and more. Springpad Multi-platform note taker for the busy person to edit, tag, and view notes. Springnote Cloud tool where you can generate text documents and share them with people.